Do You Want Women Drinking Your Beer? Yes, of course. It needs to be an automatic ‘yes’ for all. This morning I sent an email to all 252 Women & Beer Survey responders. The input they provided helped form the foundation of the book, How To Market Beer To Women: Don’t Sell Me A Pink Hammer. Do you know a woman – or are you one – who replied to the survey? Then, thanks. The original survey was 50 questions in length. That’s a good amount of time sitting in front of the computer, entering your thoughts and opinions. See, this survey is qualitative – it’s ‘messy’ data. It’s all opinions, thoughts, ideas, factors in our decision-making. I love every moment of reading and interpreting it as well. Qualitative date tells us the Why behind the action. It’s a critical, oft neglected part of research. I’ve heard some people who work in various data collecting companies say that gather this kind of data is hard and unwieldy. So? It’s the most important stuff. Only knowing statistics – what has been measured and leaves out the Why – is to leave out a huge part of the picture. The book was a 7 month intensive investment for me. It forced me to set aside other work & revenue generating activity. I had to think seriously about doing so, since I’m my own business. Everything I do affects the top & bottom lines. I discussed it with my family to ensure I had their support (I did). It’s with pride that I am now crowing about and carrying around the book to show and sell. Many people have already expressed an interest, several have purchased it. You can buy it here online now and yes, we absolutely ship internationally. Women & beer are everywhere. That’s an easy request to fulfill. Be in touch when I may be at your service: education, consulting, speaking on women, women & beer, beer & food. Workshops, pro education, media & press requests, and consulting. Book events, both public and private, are happily executed as well. Thanks. As we were wrapping up filming some spots for the book this week, lo an behold…. We didn’t plan or stage this folks. It was sheer serendipity! 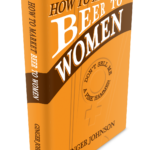 You can get your book now by calling the Women Enjoying Beer hotline: 515.450.7757. After The Great American Beer Festival you can order it online. We asked women: Why do you drink beer? What do you want from your beer? What don’t you want from your beer? What kinds of beers do you like? 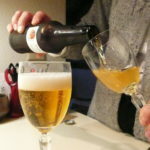 What would compel you to try a beer you haven’t tried before? Are there any beers you won’t try or buy? Why? Does size matter for your beer? What kind of atmosphere do you prefer when you drink beer? What other factors affect your buying and or consumption of beer? When are you likely to buy a beer solely based on an advertising campaign or marketing effort? What does a beer company, restaurant, bar or distributor have to do to get you to buy from them more than once? 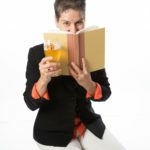 On Thursday, October 6 and Friday, October 7 at 6 PM each night in the festival’s bookstore area, Johnson will sign copies of her new book at the Great American Beer Festival in Denver. Wednesday, October 5 at 6 PM, Johnson will discuss her book at Kokopelli Beer Company as part of the brewery’s Women’s Wednesday series. Kokopelli is at 8931 N. Harlan St. in Westminster, CO.
Johnson’s main event for her book release takes place on Friday, October 7 at 1 PM at Lannie’s Clocktower Cabaret on the 16th St., Mall in downtown Denver. 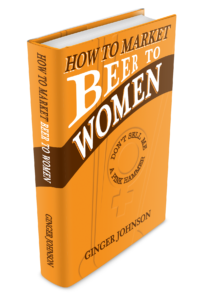 Johnson will conduct a “Beer Marketing to Women 101” class at this event and read excerpts from her book and discuss its findings. Admission is free and limited to 100 people. Ska Brewing Company, Durango Colorado, is a major sponsor for this event. “I’ve long believed in Ginger’s work and message, that’s why we’ve worked with her before. We’re very glad to support the reason for this event: betterment for the whole beer world,” states Kristen Muraro, Ska Brewing Events Coordinator. A growing number of craft brewers have benefited from Johnson’s expertise and research.